OVAs bundled with special editions volumes of the manga. Lucy comes across a mysterious written request. The client is looking for an object that is in Fairy Tail's female dormitory, Fairy Hills. To verify the request, Lucy visits Fairy Hills, and discovers that the client is Hilda, the dormitory head who is looking for a "shining treasure." Meanwhile, Natsu and the other guild members are cleaning their pool. The anime adaptation of the manga side story "Yousei Gakuen Yankee-kun to Yankee-chan," which puts the characters of Fairy Tail in a school setting. The title is a parody of Miki Yoshikawa's "Yankee-kun to Megane-chan." An all-new original story storyboarded by Hiro Mashima, the author of Fairy Tail, released on February 17, 2012. "Natsu's Secret" is going to be revealed in the "Past World"?! Guided by a "magic book" that's lying in the Guild's storage room, Natsu, Lucy, Happy, Gray, and Erza have traveled back into the past!! 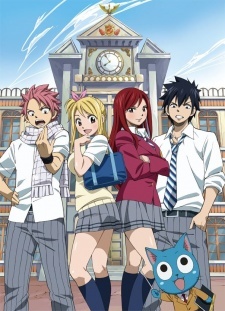 Natsu, Lucy, and the others go to a training camp for the Grand Magic Games. While there, the Fairy Tail Guild take a much needed break at the beach and hot spring. Adapting the chapter 298. The story is set during the Grand Magic Games when various guilds gather at the pool for some fun (and the chaos that ensues). Due to the bet they made during the Grand Magic Games, the time has finally come for Team Fairy Tail A and B to decide who will have the privilege to make the other team do whatever they desire, leading to a day's worth of antics from the two parties. Natsu and Erza attempt to cheer up Marvis, who has been feeling down lately. Lucy holds a Christmas party for her friends.